When you come to Benahavis you need to ensure you explore some of the amazing canyons with us. Our trained canyoning guides will give you a fantastic experience, you will get wet, your heart will pound, you will use ropes, you can jump into canyons if you want and we will keep you safe. Let's explain more about your canyoning adventure. Canyoning Benahavis : Canyoning in Benahavis on the Rio Guadalmina is incredible, Benahavis is an experience with adventure, fun and a hint of danger. Our Canyoning tours are all supervised and safe. Warning! you will get wet and have an adventure in Benahavis which is located on the Costa del Sol away from the beaches. It is a ​great location where you can try this great adventure called canyoning. It's a true adventure and is the perfect introduction to canyoning for beginners or those of you with experience. Canyoning has become extremely popular and Benahavis (Rio Guadalmina) is the perfect location for all levels and ability. 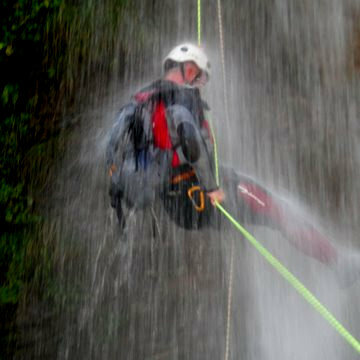 Our Benahavis Canyoning and waterfalls activities are exhilarating and relaxing activity with a bit of adrenalin rush. Benahavis Canyoning is technically a​ combination of walking, swimming, jumping, sliding down the water channels, abseiling and scrambling the river canyon. Canyoning in Benahavis with its descent takes the group down breathtaking scenery of waterfalls, natural plunge-pools with crystal water where you will have to abseil over waterfalls, jump and slide into pools, scrambling and climbing over boulders, and down gullies following the gorge as it snakes its way down the mountainside. This is a truly a different type of water sports activity that you will enjoy, its challenging and fun for everyone. Our guides at all times will ensure that you have the best introduction to this sport whilst you are canyoning in Marbella with us ​. What do you need to bring when you canyon with us? You'll need to bring a swimsuit, a pair of good grip trainers, a towel and an adventurous spirit. We will Provide all the equipment you need (5mm wetsuit, helmet, and harness and climbing ropes) and a certified guide, official permissions - Accident and Liability Insurance. 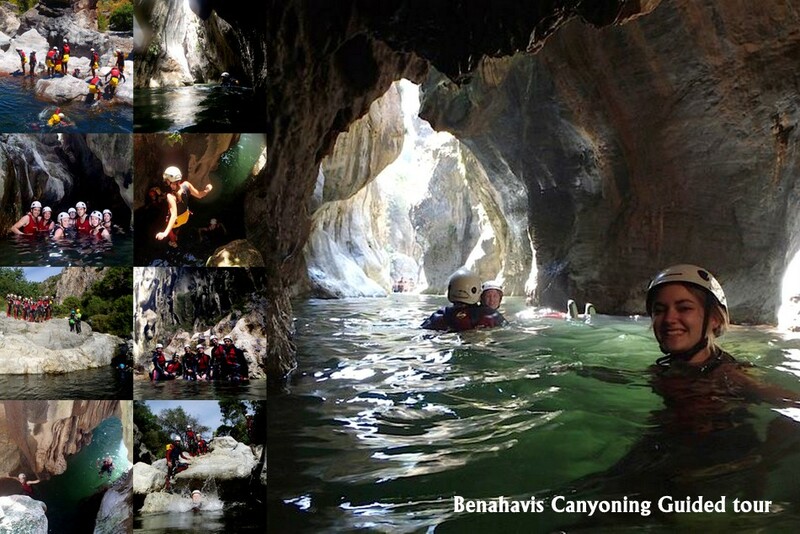 Benahavis Canyoning photos on the RIo Guadalmina, Ronda Canyoning Guided Tour activities. You Tube, Canyoning in Benahavis with Escape 2 Marbella on the Costa del Sol, Spain.